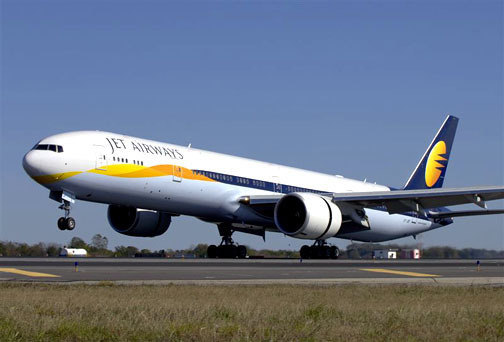 As per a Business Standard report by Aneesh Phadnis, Jet Airways (India) Ltd plans to sell all its wide-body Boeing 777 and Airbus A330 planes to raise cash and retire a portion of its Rs 12,000-crore debt. Jet Airways has a fleet of 117 planes, a mix of turboprop, narrow-body and wide-body planes. It flies the Boeing 777s and Airbus A330s to London, Paris, Brussels, Newark, Toronto and Hong Kong. While the airline says it has no plans to reduce its international operations, the management is exploring both an outright sale and sale & lease back of its wide-body planes to raise cash. The airline has 22 wide-body planes (10 Boeing 777s and 12 Airbus A330 aircraft). Six A330s are on operating lease and the remaining 16 are on a financial lease. Currently, Jet Airways does not fly all its wide-body planes. It only uses five Boeing 777s and seven A330 aircraft and has leased the remaining 10 aircraft to Etihad Airways and Turkish Airlines. The Boeing 777-300ERs planes being flown by Jet Airways service have been manufactured in 2007 and 2008.